We are back today with another guest post, and this one is such a smart DIY! Counter tops are often one of the most expensive budget items in a kitchen remodel (our recycled glass counter tops were over 80% of our kitchen budget! ), and they aren’t always in the cards. However, this project from Ann at Ann’s Entitled Life shows you that you don’t have to spend a ton to upgrade what you have, and that you never ever should feel like you need to live with something you hate just to save money! Take it away, Ann! When we purchased our Florida condo we knew we would have to do some work. The oceanfront was beautiful; the inside of the condo was all 30-year-old original fixtures and trim. One of our main update targets was our stained, pink kitchen countertop. Hubby and I spent some time researching countertop updates. We looked at granite and quartz, but the truth is as a snowbird-condo in a non-upscale community, the cost of $65/square foot didn’t make economic sense. Hubby came up with a great solution that looked fantastic! It was a leap at the time, but not only did we do this in the condo, he has since done this in rental units we own where the solution has worn very well. 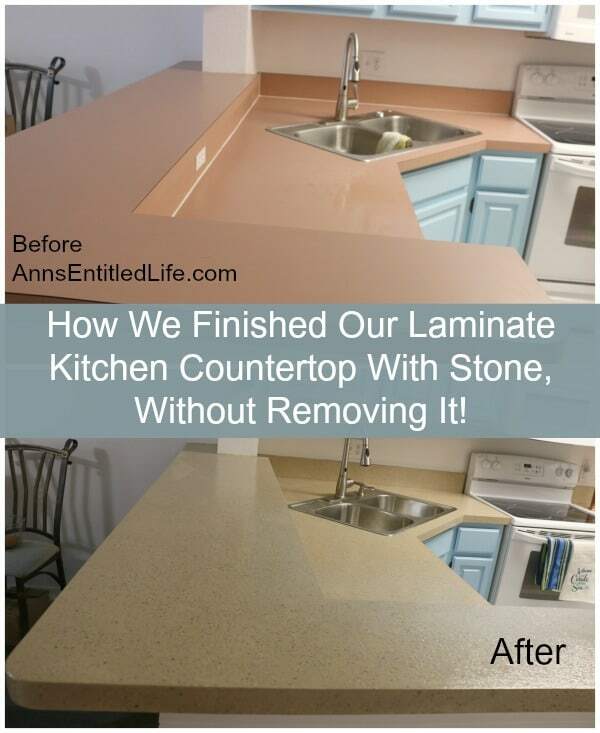 This is the easy process of how we finished our laminate kitchen counter top with stone, without removing it! Be sure to click over to check out An”s post and her whole blog!